Last week the National Reverse Mortgage Lenders Association announced that the draft of the economic recovery bill released by the House of Representatives contains a provision, which was inserted in response to a request that came jointly from NRMLA and AARP, that would set the single national loan limit for HECM at a higher level than $417,000–for the balance of 2009. SEC. 12004. FHA REVERSE MORTGAGE LOAN LIMITS FOR2009. For mortgages for which the mortgagee issues credit approval for the borrower during calendar year 2009, the second sentence of section 255(g) of the National Housing Act (12 U.S.C. 171520(g)) shall be considered to require that in no case may the benefits of insurance under such section 255 exceed 150 percent of the maximum dollar amount in effect under the sixth sentence of section 305(a)(2) of the Federal Home Loan Mortgage Corporation Act (12 U.S.C. 1454(a)(2)). According to the email, it would bring the HECM loan limit to 150% of the Freddie Mac limit, or $625,500. If the Freddie Mac limit changes, the HECM limit would change commensurately. This change is being offered as a temporary measure, thru 2009 only, because it is part of an emergency economic stimulus package. A permanent change would have to be enacted through a more appropriate housing bill. This bill must still be marked-up in Committee, then brought to the House floor for debate and a vote. After that, it must go through the Senate, so it still has a way to go. 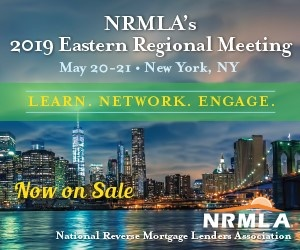 NRMLA needs everyone support in getting this done, so I encourage everyone to support the organization if you’re not a member. NRMLA’s members have access to information about its recent meeting with the Presidential Transition Team, the Government Accountability Office (GAO), and other important reverse mortgage policy issues that are important to your business.